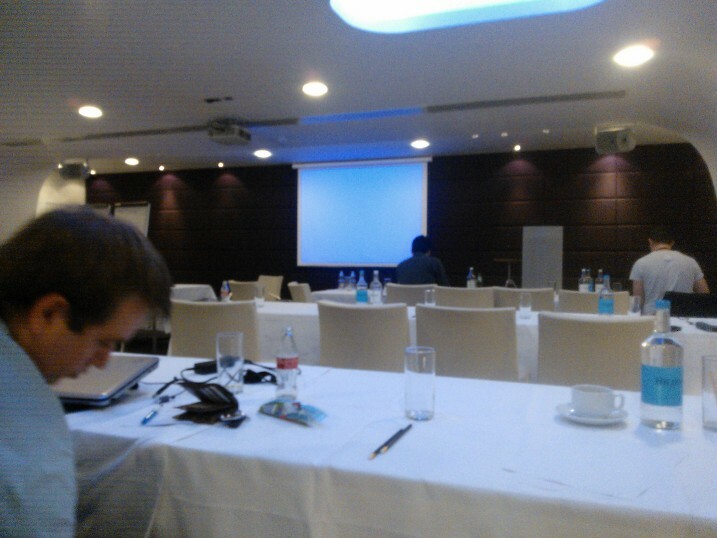 A few weeks ago a link was posted on the Microsoft UK Student Developer Group detailing a Windows Phone 7 – Windows 8 weekend in London. Originally the location wasn’t released, presumably whilst Microsoft worked out how many people would come and how much room they needed, but eventually we were told it would be at the Commonwealth Club at Embankment in London. This is the nice building you can see in the above photo! The event itself was this weekend just passed, I couldn’t make the Sunday but thoroughly enjoyed Saturdays festivities. 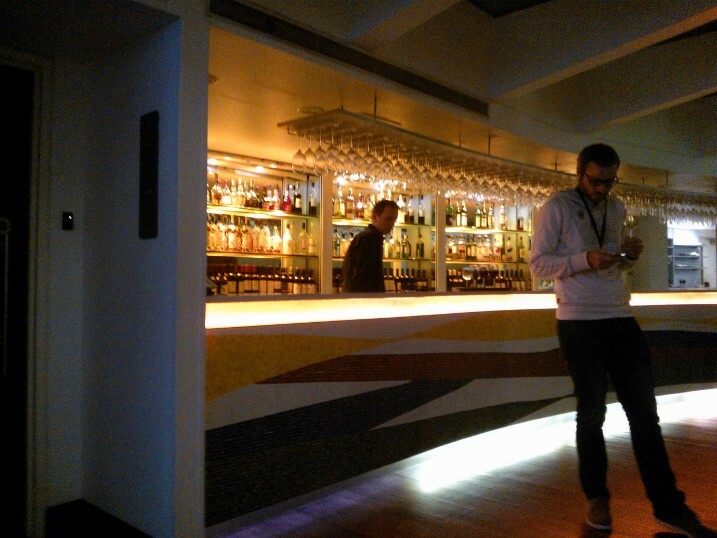 It was a snazzy place, and a great place to stay for the day, but I’ll talk more about that later. The idea of the weekend was to show people how to port their application from Windows Phone 7 to Windows 8. It also showed off some of the new API’s, Runtimes and paradigms that make Windows 8 apps an improvement over those of the phone — though I’m sure there will be API and feature parity in Windows Phone 8. One room was the “Work Zone” where developers could actively work on porting their applications from Windows Phone 7 – Windows 8 with the help of the Microsoft Evangelists. Another was the “Game Zone” where people could play Star Wars Kinect competitions to win prizes such as DAB radios. The final area was the “Talk Zone”, in which mini lectures were held with topics that had been voted in by the people at the event. As you can see, we set it up and then at a later time the method we specified in the event handler earlier is called once the download is complete. If you have loads of these async calls, or worst yet async calls within async calls it all gets very confusing, very very quickly. In C# 5 two new keywords have been implemented to ease this situation. Async, which as you can guess marks a method call as being one that is executed asynchronously and await which says “don’t execute code under me until this async method is complete”. For example we can convert our above code to a HTTPWebRequest using the new keywords. Look how simple it is! //We'll only get here once the response has completed! It’s nice because everything is where it should logically be. Together. Anyway, theres a hell of a lot more to talk about that I can fit in this already packed blopost, for example any method which calls another method which is marked as async has to be async itself, but you can find out all this at Channel 9. Metro is all about making an experience for the user, from Live Tiles which mean you don’t have to even enter an application to get its content to the exact alignment and size of text of titles, sub-titles and paragraphs in apps. Andrew Spooner delivered a great talk on how to achieve the best user experience for users when porting your application from Windows Phone to Windows 8. Although a lot of things can be directly ported in some ways — a panorama application on Windows Phone can be a panorama application on Windows 8 — some things can’t. Windows 8 has no concept of a Pivot page for example. Because pivot screens are often used to filter content, in my example the blog pivot shows only blog posts whilst the twitter pivot shows only tweets, there are a few ways to get round the limitation. You could use an application bar, a context menu or change the overall layout of the page. 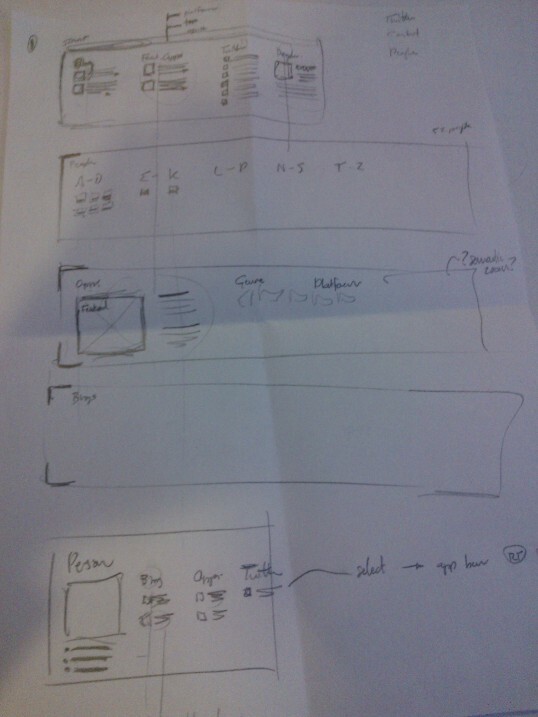 Andrew also explained about the different modes a page can be in. Landscape, Portrait or pinned to the side, and how to deal with each. You can find out more about redesigning your Windows Phone 7 application to Windows 8 or designing a new application from scratch here. The second most popular talk topic was contracts. I’ve written about my love for the idea of contracts before, when I attended the Windows 8 camp at The University of Hull a few weeks back. The idea behind a contract is that it is a way for an app to communicate with other applications in a standard way, even ones it doesn’t know about. For example a share contract says “I have these images that can be shared”. Any application that can accept images then says “I can accept these images and do something with them”. Notice how the sharing application doesn’t say what it wants done with the images and the receiving application doesn’t tell what it can do — this is on purpose to allow more interesting experiences. In a background task you can write any code you want and are totally unlimited. The only thing to be aware of is that normal applications only get 1 second of background task CPU time ever 2 hours in order to retain battery life. New in Windows 8 are notifications on the lock screen. 1 application, chosen by the user, can display its notifcations on the lock screen. Much like the calendar application does on Windows Phone 7. This chosen application is special because it gets 2 seconds of CPU time every 15 minutes. 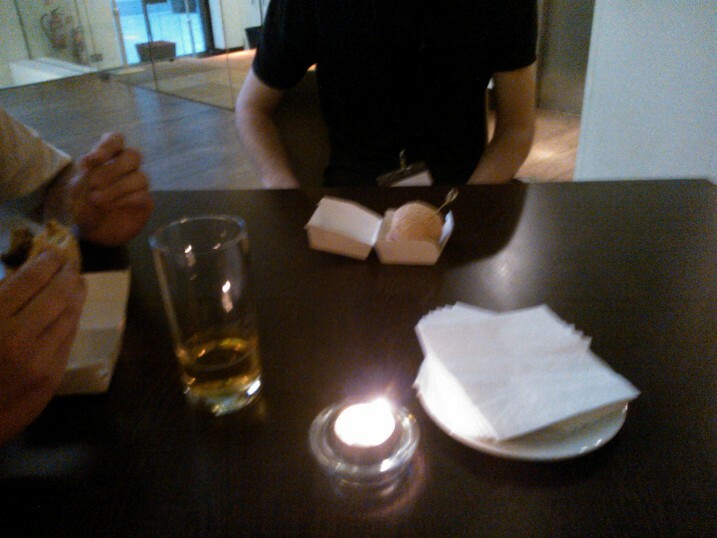 One of the interesting but non-CS parts of the day was the dinner. It was kind of weird, but cute. 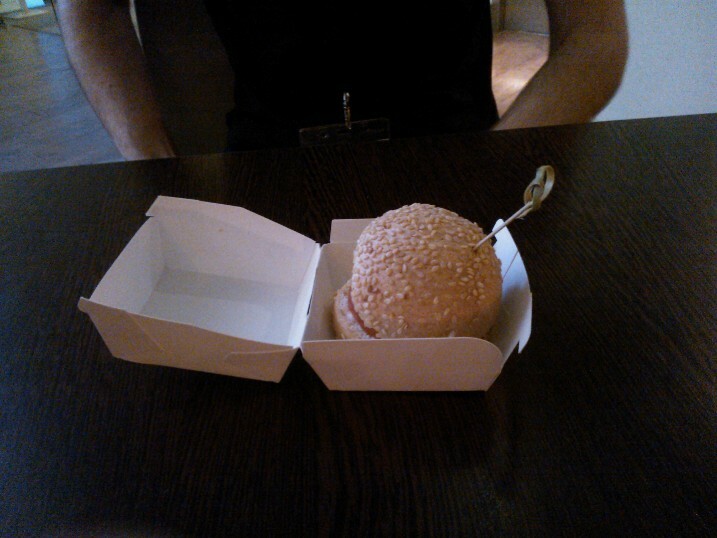 Lots of small versions of popular dishes such as burgers, there are some pictures below. The best kind of beer is free beer! 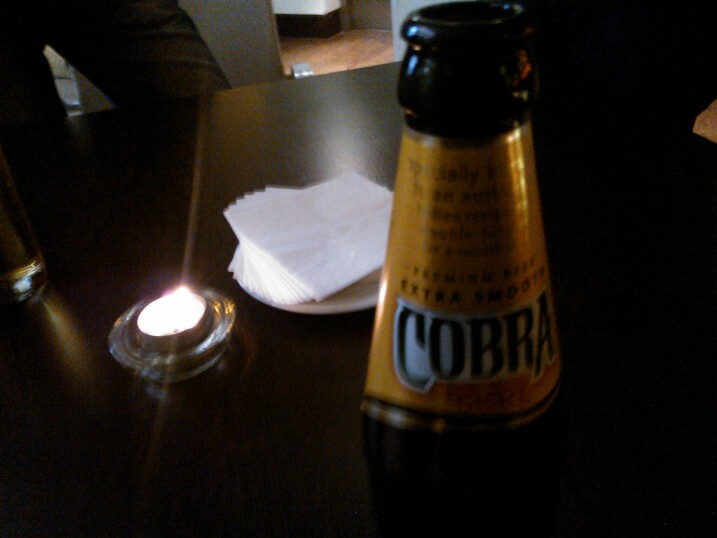 We had a good choice of drinks too! One of the opportunities of the event was to discuss getting a “store token” which allows your application to be on the store the day Microsoft releases Windows 8, days — possibly weeks before your competitors. I spoke to Paul Lo about this and should find out if I’ve successfully received a token soon! The best and most helpful part of the day for me was having a 40 odd minute chat with Andrew Spooner about porting my applications design to Windows 8. We used a programming statement and some use cases to think about the experiance — this was a methodology I haven’t used before and I found it incredibly useful, I shall be using it from now on! 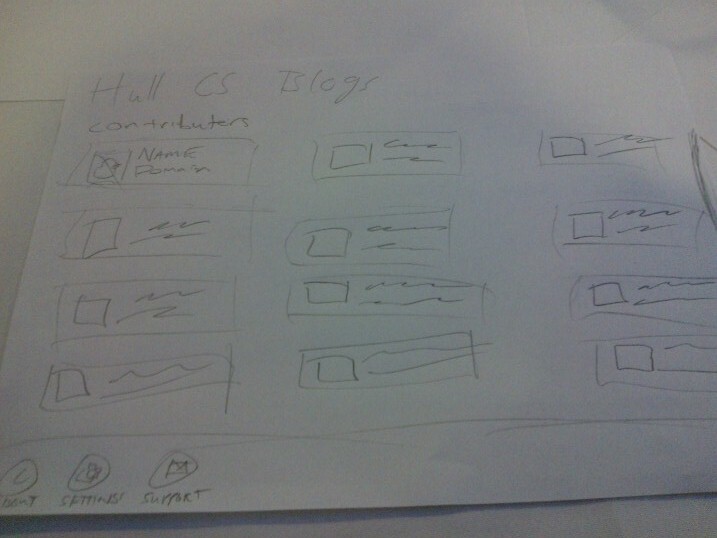 The Hull CS Blogs application aims to deliver the content of all the bloggers at the University of Hull Computer Science department to users in an attractive way whilst allowing people to discover more about each contributor, via the use of twitter streams and a list of applications they have worked on. The application will also deliver a regularly updated list of featured applications developed by people within the universities computer science department. Russell has missed a guest lecture at university, he wants to read up about it and knows that his fellow computer scientists will most likely have blogged and tweeted about it. 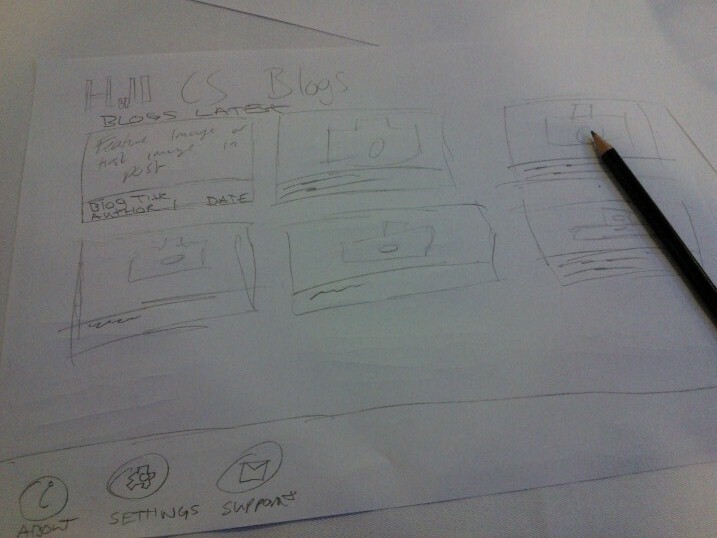 He opens the Hull CS blogs app and views the latest blogs and reads a couple. He then looks at the latest tweets for more minute by minute information, and then drills down into James’ contributor page because he cares about james’ opinion and wants to see more about what he has to say about the event both via twitter and his latest blog posts. Reading this makes you realise what features are crucial to your app. So in this situation you would need. Without this user case I wouldn’t have thought about implementing an overall twitter feed in the main panorama rather than just a per user feed in each contributors page. 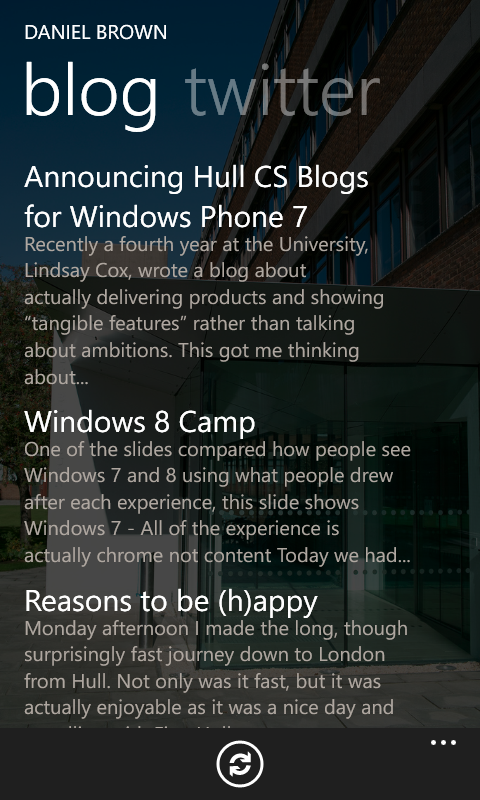 I will be using this design for the actual version of the Hull CS Blogs app for Windows 8, so check back here to hear more about that. I apologise for the length of this post but it really was such a packed day! I hope this blog has made you look forward to developing for Windows 8 and porting your existing WP7 applications, because I certainly am! I’d like to thank Microsoft for treating me so well as they always do, with lots of support, free drinks and some amazing free food. Truely an experience worth remembering!